Trained as a chemist, Barsotti began to embrace the visual arts in 1939 and started painting abstract works in the 1940s. In the 1950s, while employed as a textile and theater costume designer, Barsotti became acquainted with the Concrete Art movement but never fully embraced its theories. In 1959, along with his partner, Willys de Castro (also featured in this section), he joined the Neo-Concrete movement and he began to exhibit works that operated aesthetically in a new expressive space. Along with a number of other artists, Barsotti co-founded the Associação de Artes Visuais Novas Tendências, a venue for the exhibition of art free from the strictures imposed by any particular art movement. Most of Barsotti’s pieces are two-dimensional, but raised, surfaces that take the shape of diamonds and circles. 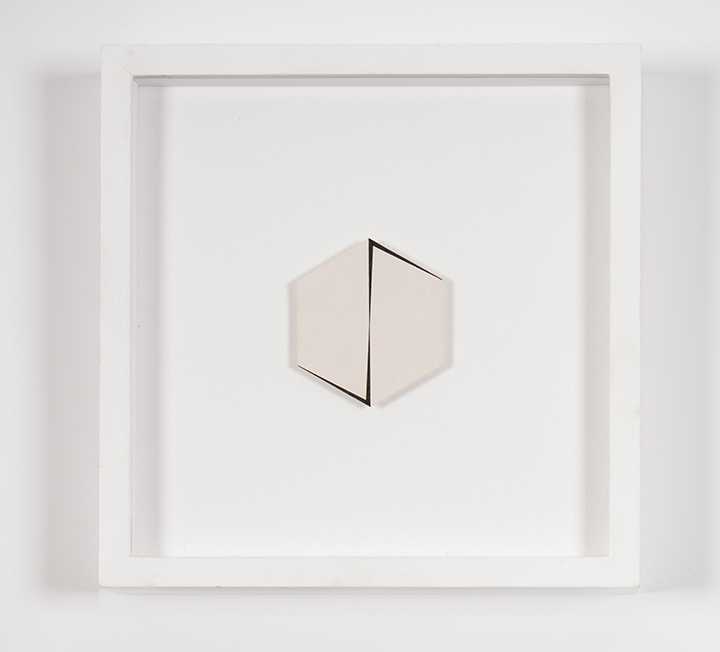 In the untitled work featured in this exhibition, the hexagonal shape is somewhat unique and yet, in an austere, Minimalist way, manipulates space through subtle fragments which interrupt the picture plane.